A few nights ago my wife Sandy and I went for the umpteenth time to the Ambler Theater, an art house cinema in the Philadelphia suburbs that I’ve praised often on this website. We were accompanied by our excellent pals, Cindy and Gene. They are Philadelphians understandably loathe to drive to the burbs, or anywhere, for fear of the nightmare that sometimes awaits them hours later when they return to their congested neighborhood and attempt to find a parking space. I hope they are not still circling their surrounding blocks these several days later. If they are . . . well, that’ll learn ’em. 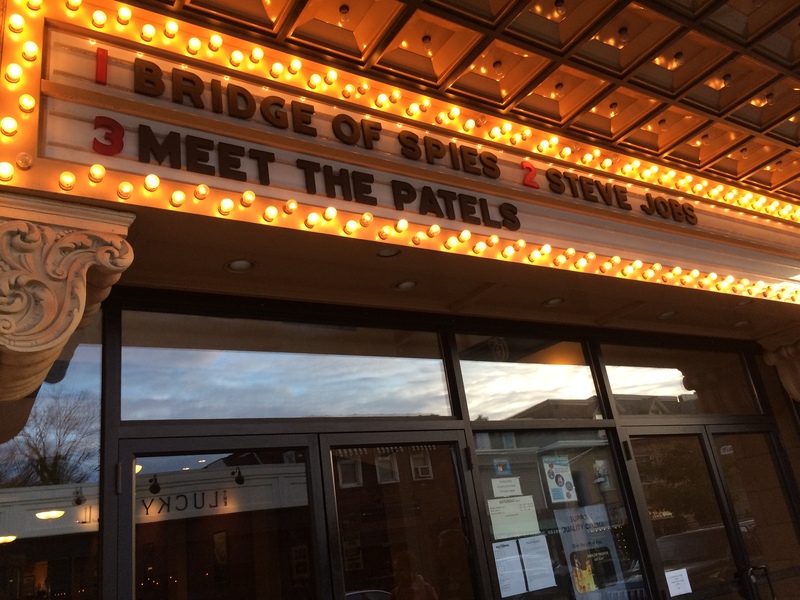 We saw Meet The Patels at the Ambler Theater. The movie we went to see was Meet The Patels. It is a delightful concoction, a documentary so breezy and cheerily assembled that I urge all of good spirit to take it in. For those not of good spirit, watching it maybe will help them find a better path in life. Nonetheless, I left the Ambler Theater not at all sure if I would comment online about Meet The Patels. Sure, I enjoyed the documentary very much. Sure, it’s worth writing about. But: 1) Hundreds of reviews of this movie already have been penned. 2) I didn’t seem to have any wondrous insights to disseminate. 3) Etc. On the other hand, my blog is a voracious master, compelling me to keep it fed. 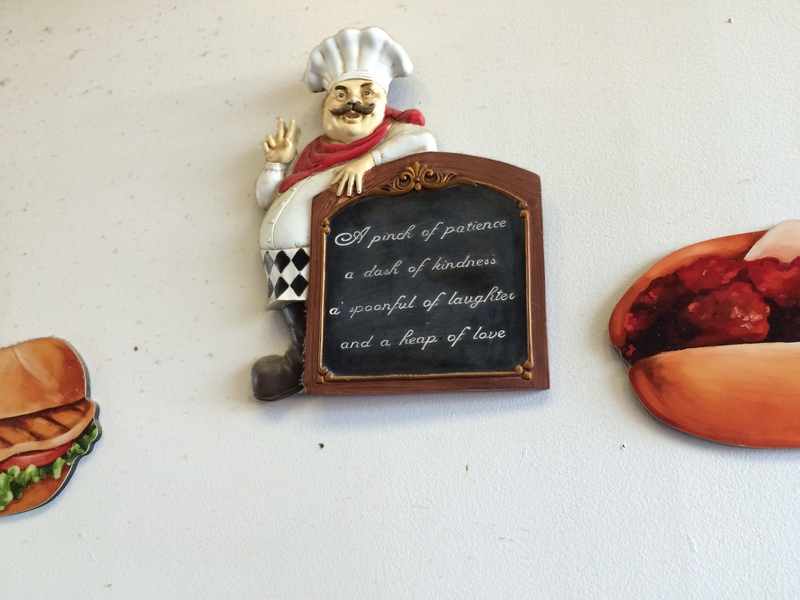 Words of wisdom attached to a wall at Randazzo’s Pizzeria. Those are words not to be taken lightly. They truly are meaningful. They are a good recipe for life. And they illuminate what, to me, Meet The Patels is all about. And thus a pizzeria inspired me to sit down and type this report. Meet The Patels concerns a family of four, the Patels. Natch. Husband and wife, India-born Vasant and Champa, moved to the States decades ago for better opportunities than they saw available at home. They became accustomed to the American Way, but hung on strongly to their native customs and values. Stateside they produced two children, Geeta and then Ravi. Now young adults, the siblings are highly Americanized, yet cognizant and appreciative of the Asian culture that undeniably runs through their veins. All four Patels, as best I could tell, reside in California. Mr. and Mrs. P occupy a roomy home. Geeta and Ravi, touchingly, share a comfortable apartment. How many adult siblings live together? Few, by my experience. In this documentary, Geeta and Ravi seem to pull it off easily. On to the plot. Meet The Patels spins the tale of Ravi’s search for a wife. Having recently broken up, after a two year romance, with a white girl named Audrey, 29-year-old Ravi somewhat reluctantly agrees to allow his parents to try and find a suitable match for him. Only thing is that Mom and Dad never knew about Audrey. Ravi was too embarrassed ever to tell them that he had dated a female of the non-Indian-American persuasion. Mom and Dad, successful products of an arranged marriage — arranged being the norm in India — were under the impression that their 29-year-old son was kind of a relationship tyro. And that his unstated goal was to settle down with someone who shared his ethnic background. Coolly they convince Ravi to allow them to employ slightly updated versions of traditional Indian matchmaking methods to identify and locate a mate for him. Said mate is to come from the large pool of well-educated and fine-tempered Indian-American and Indian females that Ravi’s parents are confident exists. Let the games begin. Meet The Patels moves fast and furious, Geeta handling most of the camerawork in an engagingly amateurish home movie mode (she claims she never learned how to operate her camera, or frame scenes, properly). The film intersperses animated sequences, scripted and nimble, to explain and give oomph to the plot. The plot doesn’t require more elucidation from me. No spoiler alerts here. What really matters are the lessons about human behavior and relationships to be gained from the flick (and from the Italian chef’s chalkboard). To wit, the four principles in Meet the Patels are endearing, warm and loving. They respect each other and get along famously. They are open (excepting Ravi’s concealment from Mom and Dad of Audrey’s place in his life, but we’ll forgive him that) and open to change. They smile a lot, laugh a lot. These are folks you’d want to be friends with. Sandy, Cindy, Gene and I all left the theater feeling good. Amen. Next Article I Never Met Thelonious Monk, But . . .
My sister and I laughed our way through “Meet the Patels” this past Tuesday night. Our youngest brother is married to a Patel in Massachusetts, so we could really relate! Your brother and his wife would get a kick out of this movie (if they haven’t already seen it). Sounds like an interesting movie–and I empathize with your parking-seeking friends! Let’s hope they found a parking spot near their home! I’m glad the pizzeria inspired you to write a review; I wouldn’t have wanted to miss reading the Patels, and I’ve added their movie to my must-see list. Thanks! Janet, I’m glad you liked this review. Thanks for reading my take on the Patels. We were travelling in Europe when this was on in Australia, but now I am compelled to see it. And just so you know, this is the first review I’ve seen of it, so it was definitely worth writing.